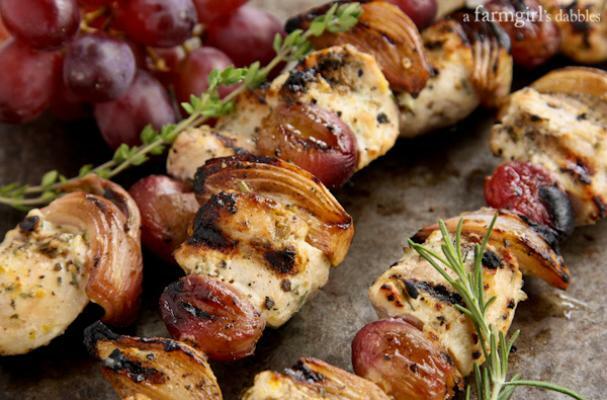 Grilled herb chicken skewers from A Farm Girl Dabbles will help you kick start grilling season. Cubes of boneless skinless chicken breasts are marinated in yogurt with herbs, garlic and vinegar before hitting the grill. Instead of summer vegetables between the pieces of meat, this recipe calls for sweet grapes and shallots - think chicken salad meets the grill. A tip whenever cooking with wooden skewers, soak them in water for several hours before putting them on the grill. This will prevent them from burning while the chicken cooks. Serve this chicken with a fluffy couscous or orzo salad and assorted grilled vegetables.